Most people think of being frugal as learning where to save, how to find the right sales, judicious use of coupons. However, for me a huge part of being frugal is being resourceful. Being able to find resources that will otherwise go unused, but that can provide significant value to your home, is a great skill. It is important to learn how to see the value in seemingly unvaluable things, and how you can transform them into something better. It also helps to have friends who have overloaded crabapple trees. Growing up I always saw crabapples as a useless plant. My backyard neighbors had a big tree, and I always understood that they were technically edible, but not very good. It always seemed such a shame. As I get older and learn more about food processing I have learned that what isn’t very good raw has great potential in other preparations. In this case it’s crabapple jelly. I am not normally a big fan of sugary things, and prefer to use alternatives to refined sugar such as honey or agave nectar. However, in this case sugar is our friend and will make something that I consider inedible raw into a very tasty treat. The other thing about sugar is that it does help reduce the possibility of spoilage because of its hygroscopic properties soaking up lots of the liquid. The crabapples we are using are very acidic, which is another thing that will prevent spoilage. This type of canning is very accessible to novices because you don’t need a lot of special equipment, and we’re working with ingredients that inhibit bacterial growth naturally. If we weren’t using acidic ingredients we would need to use a method called pressure canning. That does require some special (and expensive) equipment, so we’ll stick with the easier stuff. Water bath canning is a method where, at its most basic you boil your lidded jars of food for a specified period of time so the food comes up to a bacteria-killing temperature and a special compound on the lids gets a proper seal. There are specific steps involved to ensure, as much as possible, that you don’t contaminate your food along the way. It’s very important to follow these steps, and while I will be as detailed as possible, it’s not a bad idea to purchase an up to date book on canning or bring a knowledgeable friend along. I use a current version of the Ball Blue Book by a well known jar manufacturing company. This certainly isn’t the only (or even the best) resource out there! Intimidated by canning? You can freeze your jelly pretty easily. If you are using jars, make sure the sides are completely straight, otherwise you’ll have broken jars. Ask me how I know. Do not use the metal lids that come with your jars as they might corrode in the humid atmosphere of your freezer. Some stores sell plastic lids perfect for jars and freezer/refrigerator storage. Alternately you can use any freezer containers you have on hand. First we need to extract the juice from our crabapples. You could probably do this with regular apples, but I recommend applesauce for those instead. It’s another easy, and very tasty, way of preserving your apples. This technique should work for almost any recipe that calls for “juice for jelly”. Wash your crabapples. My method involves washing out my kitchen sink, and filling it with water and crabapples. Don’t worry about the stems, but make sure any twigs, leaves, and dirt get removed. Put crabapples into a large pot, and add water. You will need approximately 1 quart of water to each quart of crabapples, but this is not an exact science. Turn heat to high, and cook until apples are soft and mushy. Once you get to a boil it will probably take 5-10 minutes. Set up your straining system. If you have a small amount of crabapples, use another large pot or bowl and suspend a colander over the top. When working with 13lb of crabapples like me it helps to find a large food grade bucket*. Use a clean kitchen towel, several layers of cheesecloth, or (my favorite) a flour sack towel in the collander to keep everything but the juice from getting into your container. Pour crabapples and juice into the collander. You may need to do this in batches. Let the juice drain. You can help it along with a spoon if you like. To really get every last drop, draw up the edges of your cloth and twist it all together to squeeze out the juice. Do this for as long as your patience allows. You now have crabapple juice! You can go ahead and try it, but it’s not exactly thirst quenching. * Your local cafes and restaurants throw away all kinds of food containers and buckets. If you have a favorite friendly place, ask if they’ll let you take one the next time they have an empty. It helps if they’ve seen your face before as a regular, but most places won’t have a problem with this. Just be sure to wash it well before use. I think this is the best part. If you’re not canning, you’ll be nearly done after this. If you are canning, I recommend that you set aside a good chunk of time to do this (several hours at least) so that you can be sure to complete the process. If you don’t have time after making the juice, store it in the fridge until you are ready. Wash and inspect jars and lids. Put the jars, rings, and other equipment you’ll be using in the dishwasher with a heated dry setting so that they’re nice and hot and ready to go when you fill them. If you don’t have a dishwasher, put your jars and rings and tongs into your canner filled with water, and heat to a boil. You need to sterilize your jars, but you also need them nice and hot when filling with your hot jelly. Using a small pot, put lids in water and heat to a simmer. Keep at a simmer while working on the rest of the steps. This activates the ring of compound on the underside of the lid so it will seal to your jar. While everything is heating: Combine crabapple juice and sugar in a cooking pot, and heat on high stirring constantly. Bring to a boil, and cook until the gelling point. This may take some time, and the most reliable method is using a thermometer. 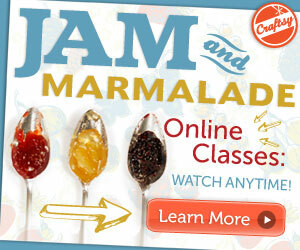 [Check out Making Jams and Jellies – Testing Jelly without Added Pectin for more details.] You can try testing by dipping a cold spoon into the jelly, and letting it slide off the spoon away from the hot steam. If you get sheets of liquid (see link above for picture) you’re good to go. Alternately you can put a bit of the liquid on a plate, and set it in the fridge. Once it has cooled it should be jelly consistency. The temperature you need will vary depending on your elevation, so check out the link above for a more exact gauge. Set jars on a clean towel, and begin filling them with jelly. Make sure to use your funnel to keep things clean. Leave 1/4 inch headspace [see What is Headspace?]. This is the space between the very lip of the jar, and the surface of the liquid. A headspace measuring tool can be found in most canning supply stores, but it’s not required. Use this same tool, or a sterilized utensil to slide it around the sides of the jar and remove any bubbles. With a clean towel, wipe any drips off the rim of the jar to ensure a complete seal with the lid. Without touching the bottom of the lids, place a lid on each jar. This where that magnet wand really comes in handy. You can use sterilized tongs if necessary, but I’ve done that and it’s a pain. I bought a wand after that. Screw the rings onto each jar, being careful not to put them on too tightly. You want to make sure they’re “finger tight” which for me usually means as tight as I can get them without having to hold the hot jars. Once your jar starts to move as you turn the ring, it’s tight enough. Don’t overtighten! Using your jar tongs, place each jar into your canner. If you don’t have enough jars to fill your canner, fill some empty jars with hot water and use those in the empty spaces to keep them from tipping over in the canning process. When working with half pint jars this will usually be necessary. Bring canner to a boil, and boil your jars for 10 minutes. Be sure to go for at least 10 minutes, and if they go for a bit longer it won’t hurt them. Let them sit for 5 minutes before removing them from the canner to prevent siphoning. Ahh siphoning. This is when your liquid in the jar seeps out during the boiling stage. If you haven’t filled your jars too high, and are working with a fairly liquid product, you shouldn’t have any problems with this. However, this seems to be a problem that plagues many a canner. The jars that do siphon should be fine as long as you inspect them for a proper seal carefully. Clean any sticky residue from underneath the ring of the jar for storage. Remove jars from canner and set them on a double layer of towel to cool. You’ll hear a “pop-pop!” as each jar seals and cools. This is such a satisfying sound telling you that you’ve done your job well. Once the jars have cooled, remove the rings and inspect them for a good seal. If sealed well your jars should last you about a year. When it comes time for eating, make sure to do a check before opening your jar. There should be no visible mold, and your lid should not pop when you press down on the top. There should be no strange smells coming from the food, and if anything looks even slightly off when you open it, toss it and try another one. You won’t likely ever encounter a problem with contaminated jars, especially if you follow the proper canning steps, but it’s always good to stay on the side of caution. Phew! You’ve gone and canned some delicious crabapple jelly. If you’re giving these as gifts, there are lots of creative ways to decorate them. I like to put cut-out paper circles on top of the lid, but under the ring, with a decorative image so I can label and date them. I also like to put a simple sticker on the lid first with a date just in case the paper label gets lost. Finish it off with a simple piece of ribbon and you’ve got something that doesn’t look like it barely cost you anything (and hopefully it did). Written on October 11, 2013 by Kristin (Yankee Girl). Stop peeling your garlic! Set it down on your cutting board with the flat of your knife on top of it. Give your knife a quick bang with the heel of your hand (carefully away from the sharp edge) and your garlic will pop right out of the paper shell.